Despite possessing world-class players Jarome Iginla and Miikka Kiprusoff, the Calgary Flames saw their 2007-08 season end much sooner than anticipated with a first-round exit in the Stanley Cup Playoffs. Under the belief that his team needed more firepower, Flames General Manager Darryl Sutter spent the offseason adding the likes of forwards Mike Cammalleri and Todd Bertuzzi. Both are expected to help Calgary win more of those always-tight games in the Northwest Division. Cammalleri and Bertuzzi can only be excited about skating alongside Iginla, who ranked third in the League last season in both goals (50) and points (98). With the loss of center Kristian Huselius to free agency, the trio of Iginla, Cammalleri and Bertuzzi will be heavily relied upon to produce offense. After signing as a free agent, Bertuzzi admitted it was Iginla's persuasion that won the power forward over. "Jarome is 100 percent why I am a Calgary Flame," Bertuzzi said in July. "It was exciting talking to him. We respected each other when we played against each other. I have always respected how Jarome has played and been in that market. He probably could have gone somewhere else, but he has always stayed. I'm looking forward to being his teammate." In Calgary, the goaltending can be summed up in two words: Miikka Kiprusoff. The 31-year-old appeared in all but six games during the 2007-08 regular season, going 39-26-10 with a 2.69 goals-against average and a .906 save percentage. Kiprusoff will once again be the No. 1 netminder this season, with 25-year-old Curtis McElhinney as the backup. He saw 149 minutes of ice time last season, allowing five goals on 51 shots. Indeed, Kiprusoff is both reliable and durable. He has played at least 70 games in each of the last three seasons, and has won at least 39 times in each campaign. "He can change the momentum of a game in a blink with one of his saves," Iginla said of the Flames' last line of defense. "Some of the saves he's made can, well, be contagious -- and we all get caught up in the momentum. I've never seen a goalie so calm and relaxed and confident." Perhaps tired of his inconsistency, Sutter shipped forward Alex Tanguay to the Montreal Canadiens at the 2008 draft in exchange for a first-round draft pick. Tanguay had just 18 goals in 2007-08. Sutter is banking that Cammalleri's arrival will pay big dividends. Entering the final season of his contract, the 26-year-old may very well be just what the doctor ordered. While he didn't have the season most anticipated (47 points in 63 games), Cammalleri has scored 79 times over the past three campaigns. Cammalleri won't be alone up front. He is joined by Iginla -- one of the game's best all-round players -- as well as Bertuzzi, who signed a one-year deal after notching 40 points (14 goals, 26 assists) in 68 games for the Anaheim Ducks. Even though the Flames did lose Huselius to the Columbus Blue Jackets, they still have Daymond Langkow at center. Langkow -- who turns 32 on Sept. 27 -- is coming off his second-straight season of 30 goals or more. He hasn't scored less than 20 since the 2000-01 campaign. While veteran Owen Nolan is no longer with the club (he signed with the Minnesota Wild in July), the Flames still carry the reliable Craig Conroy, who had 34 points in 79 games last season. Calgary will certainly be hoping for bigger things from Matthew Lombardi, who is entering his fifth season with the club. After scoring 20 goals in 2006-07, the 26-year-old found the back of the net 14 times last season. Looking to add depth, the Flames also signed Rene Bourque -- who had 10 goals last season for the Chicago Blackhawks -- and enforcer Andre Roy. They will have the chance to round out the third and fourth lines, along with Eric Nystrom, Wayne Primeau, Curtis Glencross, Marcus Nilson and Dustin Boyd. The Flames' blue line begins with Dion Phaneuf, the 6-foot-3, 215-pound monster who is likely to be an annual candidate for the Norris Trophy. Phaneuf appeared in every game last season and finished fourth on the team in scoring with 60 points. His 182 penalty minutes led the club. "Dion's got an edge to his game," Sutter said of his top defenseman. "People aren't sure about him. I think that's why some people have compared him to such a scary defender as Scott Stevens, but he's more than that. He's a heart-and-soul player. He's smart, knowing when to take a chance on offense and when he can make a big hit and not hurt the team on defense." Phaneuf will have some veteran help again with the return of Adrian Aucoin. The 35-year-old enjoyed a rejuvenation in Calgary last season, going 10-25-35 with a plus-13 rating. 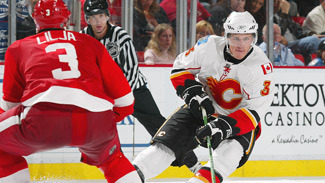 Aucoin had just 16 points the prior season with the Blackhawks and was dealt to the Flames in the summer of 2007. Also back in the fold are alternate captains Robyn Regehr (20 points, plus-11 rating last season) and Rhett Warrener (who was limited to just 31 games), as well as Anders Eriksson, Cory Sarich and newcomer James Vandermeer, who played for Calgary, Chicago and Philadelphia last season. * As long as Kiprusoff is healthy, the Flames will be competitive in basically every game. One of the League's best, Kiprusoff has more shutouts (26) than any goaltender in franchise history. * Not only does Calgary have one of the best goalies, it also possesses one of the best forwards in Iginla. The Flames' captain is coming off his second 50-goal season and has scored 30 or more goals seven straight times. * Calgary's depth up front is impressive. Besides Iginla, the Flames have enough firepower to keep pace in the Northwest Division. Players such as Todd Bertuzzi and Mike Cammalleri have added incentive, given the fact that they will both be free agents after this season.